When SP and I moved in together, he had an ice cream maker. One day, we decided to make ice cream and discovered that his ice cream maker was broken. So much for that idea. I think I've mentioned before that we almost didn't register anywhere for wedding gifts because we had each been on our own for so long and accumulated so many kitchen gadgets and appliances that we thought it wouldn't really be worth it. But then we reconsidered - when we really thought about it, we realized there were quite a few items on our 'Wish List' - like a new ice cream maker. Thanks to Zurdie and her SO, we have a wonderful new ice cream maker: We've been waiting to try it out. I don't really like ice cream when it's cold and the past week or so hasn't been all that warm here in Pittsburgh. Plus, making ice cream isn't really a spur of the moment thing. 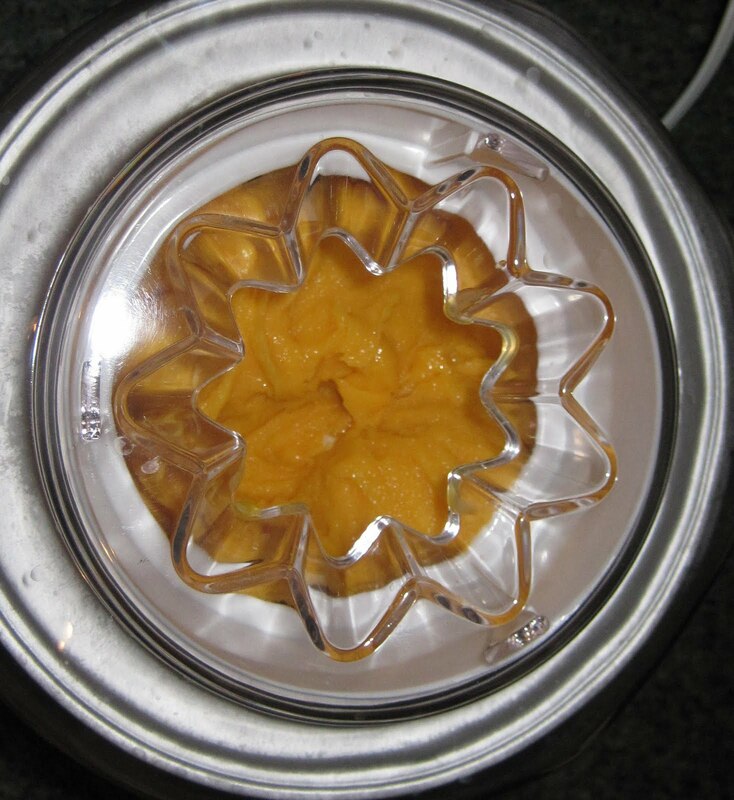 The ice cream maker freezer bowl needs to be frozen in the freezer ahead of time before using it and the finished product needs/benefits from some time in the freezer before you enjoy it. We perused the recipes that were printed in the User Guide that came with the ice cream maker and decided to try a sorbet, not ice cream. 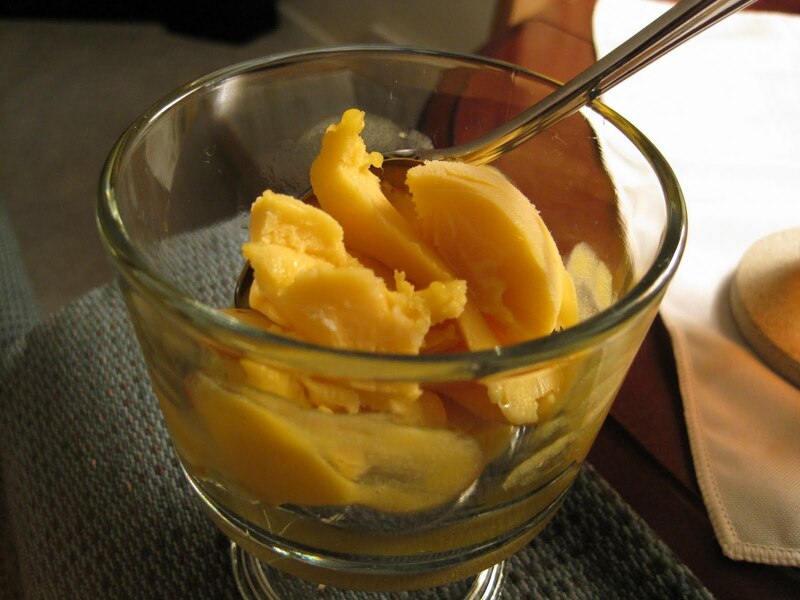 We decided on Fresh Mango Sorbet. On his weekly Costco trip, SP bought mangoes: Saturday evening, after we got home from Te Cafe, we made the mango mixture. Yes, at 11 pm we decided to start making sorbet!!! 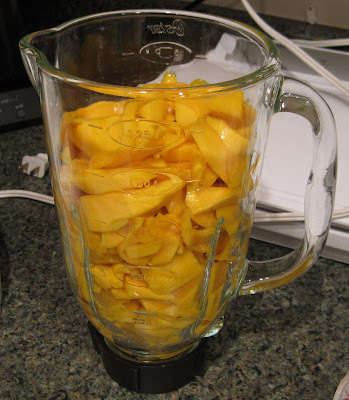 We peeled, pitted, and chopped the mangoes and placed them in the blender: We added fresh lemon juice, sugar, and corn syrup and pressed 'puree.' 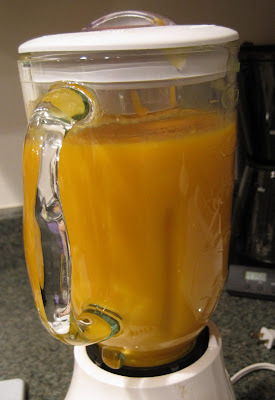 A few minutes later, we had a smooth mango mixture which we placed in the refrigerator overnight. Sunday morning, SP poured the mixture into the freezer bowl and turned on the ice cream maker. The recipe said it would take 25-30 minutes. It took longer than that - possibly as long as 45 minutes. The machine senses when the mixture is ready and turns itself off. It's a little loud, but SP said that compared to his old one, this one is actually 'quiet.' 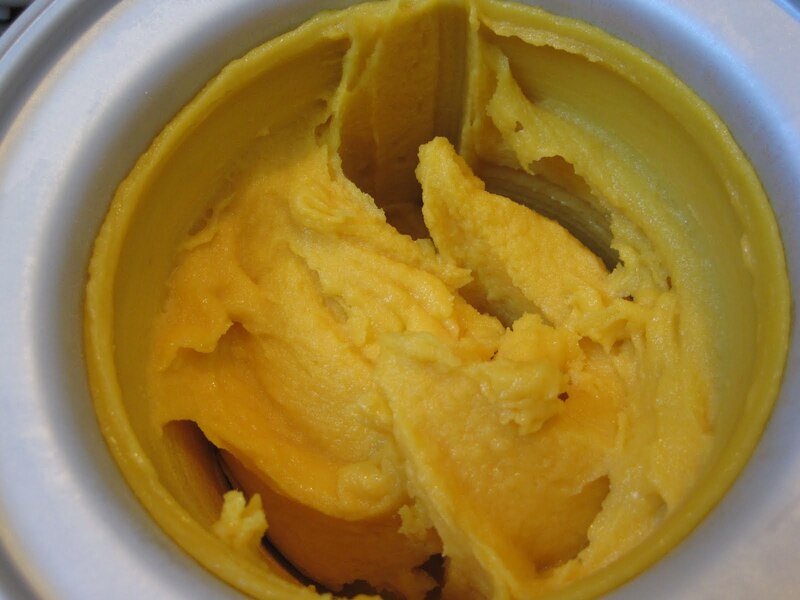 He scooped the mixture from the machine into a couple of plastic containers and placed them in the freezer. 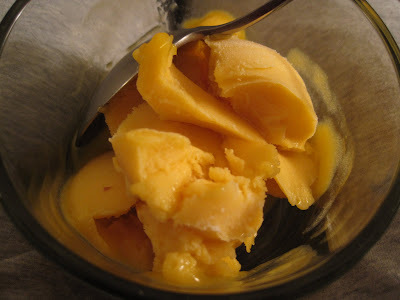 Sunday evening, around 9 pm, we decided to try the sorbet. It was a little hard to scoop out. We had to let it soften for a bit. It's very good. 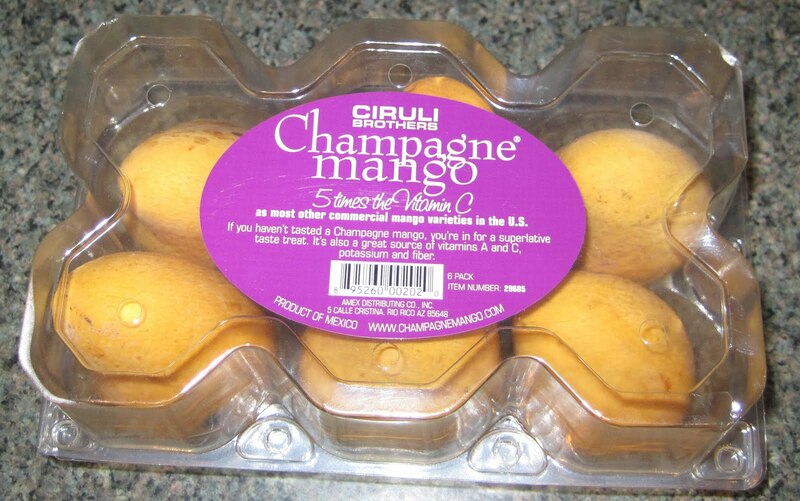 A nice mango flavor. Not too sweet. Smooth. A very good first use of the ice cream maker. Especially tasty with a dollop of whipped cream on top. Combine all ingredients in blender or food processor until thick and smooth. The mango puree may be refrigerated for up to a day; refrigerate until ready to process in ice cream maker. Turn machine on, pour puree into freezer bowl through spout and mix until thickened, about 25-30 minutes. Makes about 10 1/2-cup servings. 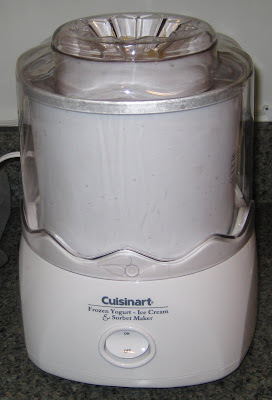 sorbets are one of my favorite things to make in the ice cream maker! I have done strawberry, melon, and pineapple. So good! I do generally notice the homemade sorbet gets very hard in the freezer. I have read recipes where you add some vodka or limoncello to the mixture to help it from freezing solid. I have tried the limoncello and I think it helps a bit. Adding limoncello sounds good, especially if it's a lemon sorbet. We'll have to keep that in mind the next time we make sorbet. That just sounds and looks awesome. 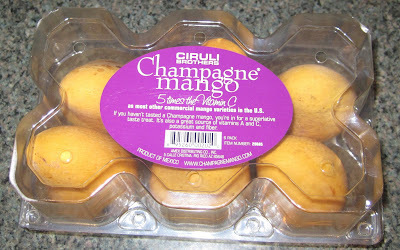 I just saw the champagne mangoes at wholepaycheckfoods and considered buying them, but they were too expensive for me. Yummy! Best. Meal. Ever. The Charleston Grill.